Several years ago the aquatics director asked me if I would be interested in running the swim camp. She let me run with it. I came up with the theme of “Swim Like a Beast” and chose a different animal for each day: jellyfish, golden retriever, otter, dolphin, and frog. The best thing that came out of that camp was a game called Otter Island. My friend Katy was helping me. I told her I was thinking about a game like “Sharks and Minnows” (standard pool fare) but we could make it sharks and otters because sharks eat sea otters. The kids love climbing on the big floating mats. “When they’re on the island,” I said, “they run the risk of being grabbed by an eagle.” I had read that bald eagles predate on otters. Before long, we had concocted a game that was fairly crazy and totally fun. I realized then how fun it is to collaborate with Katy. We both throw ideas around, bouncing them off each other, like the ping-pong balls that sometimes show up in our games. Katy has ping-pong balls that look like eyeballs. She’s that kind of person. I’ve never done the same theme twice for swim camp. One year we did Skull camp — and we did lots of sculling, trying to teach kids how to feel the water. One year we did the Incredibles and called it an Incredible Swim Camp. I love collaborating with Katy. This year’s camp was called A Quintessential Swim Camp — and we used the five classical elements: earth, water, air, fire, and æther. We did science-y things in and out of the water. On Thursday night, as we were trying to come up with a bang-up game to end on, Katy and I bounced ideas off each other — and ended up incorporating those ping-pong balls. “What if we had kids blowing ping-pong balls across the pool –” she said. “Okay, that’s the air,” I said, mentally check-marking one element. “And other kids could be splashing them or making waves in the water to make it difficult,” she said. “Yeah! And they could be trying to grab the ping-pong ball or tag the person or something,” she said. “It sounds chaotic,” Mat said — and it was. Chaotically fun. 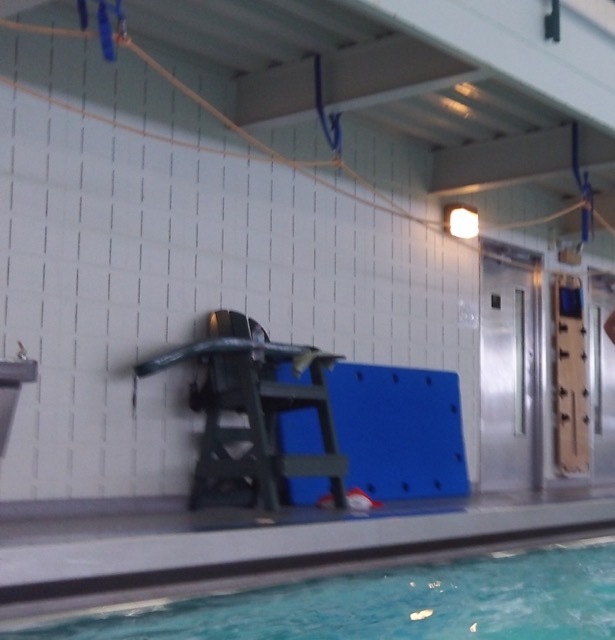 Swim camp was fun — once we figured out those initial obstacles — but I’m not doing it again. “I’ve heard that before,” one of my kids said. How I would have LOVED to take part in one of your swim camps … I could have been like Adam Sandler in that movie where he has to go back and repeat every year of school. I could have done that. To take part in the magic you created with Katie …. Ha! That would be so fun to offer a swim camp for adults. Most adults taking swim lessons are so self-conscious that they haven’t learned to swim yet that they have trouble relaxing in the water. Maybe if they played with ping-pong balls that look like eyeballs they would forget their awkward. It sounds like it was fun!